There is a part of me that loves to organize, schedule, create new beginnings, and see structure. It just fills my heart with joy to have a place for everything (I haven't labeled the drawers yet, but watch out!). 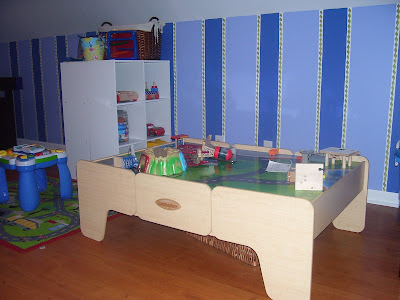 Over the last few days I have had ideas floating through my mind as to how I wanted to rearrange the playroom. 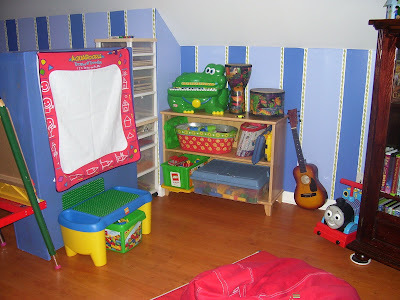 The boys needed a little change up, and I was trying to create a space where our art supplies were more readily available. 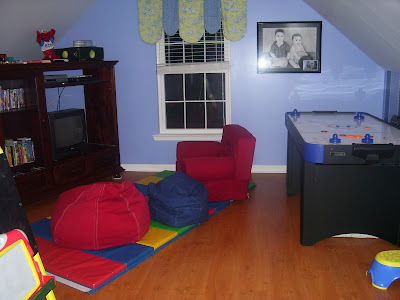 So here's the newly rearranged playroom with mini "play spaces" to help break up the room. I am excited to think that one of those sections is where we will call homeschool. 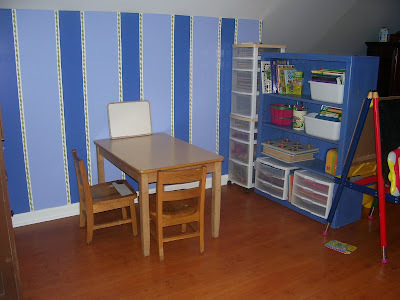 Grantly, that's not the only place we will do school, but it was fun to get all my supplies in one spot. Looks so awesome!! Is the train table a new addition? Has Ems seen that...she loves the one in the toy store off of the square. I like what I see girl! Good work! That will pay off.